Yet another of my musical heroes has passed away, and once more too young. 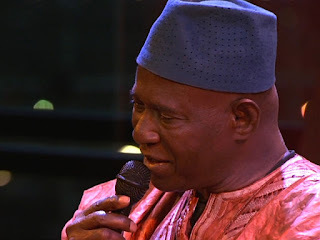 I still had high expectations from Kasse Mady Diabaté, who passed away in Bamako, Mali, this Friday (May 24, 2018) at the age of 69. Kasse Mady was born in 1949 in Kela, a village 100 kilometres south of Bamako, upstream on the Niger river, and a village renowned for its djeli population and its proximity (only 8 km) to the village of Kangaba, which is seen as the craddle of Mande culture. Although born into a family with deep griot roots (his aunt was the great Siramori Diabaté, see this post) neither his father nor his mother were djeli (other than by birth), and Kasse Mady started out by helping his father, cutting grass for the horses. 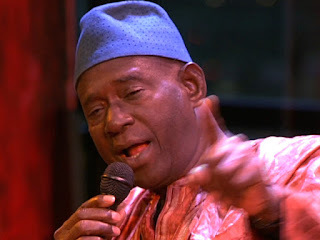 But even at a young age his voice stood out, and many started to compare him to his great grandfather Bintoufama Diabaté, nicknamed 'Kasse Mady'. Still in his teens Kasse Mady builds up a reputation singing at weddings, baptisms and such, until he is asked to join the orchestre Super Mande from Kangaba, which subsequently participates in the first Biennale Artistique et Culturelle in 1970. A few years later he joins Les Maravillas de Mali, at a time when the orchestra is in a state of great unrest, after having been heavily censored by the new government of president Moussa Traoré. When the chef d'orchestre is replaced the name of the orchestra is changed to Badema National. At Badema Kasse Mady is able to really make his mark, and he stays with the orchestra for 16 years, until he lured away by producer Ibrahima Sylla in 1989. He moves to Paris where Sylla produces his album "Fode". I guess the first time I heard Kasse Mady sing was in the mid 1980s. I don't remember being very impressed, but this may have been due to the rather miserable quality of the cassettes (copies of copies of copies). This changed dramatically when I heard the song "Fode Nara", while visiting Bamako in 1988 (here is the actual recording; I missed the beginning..). I certainly wanted more of this. 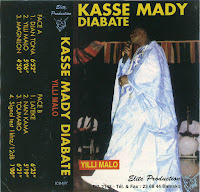 Unfortunately there would be little more of Kasse Mady with Badema, as the public institutions responsible for the national orchestras disintegrated and musicians had to look elsewhere to find an income. Kasse Mady, like many others, moved to Paris. Personally I think his album "Fode", (over)produced by Syllart, was a step backwards. Even today, after years of musical abuse from (especially) Paris-based productions, I still can't stand more than two minutes of this album. Fortunately the production was toned down a bit with the following album, "Koulandjan". While still very much a Parisian production, at least Kasse Mady gets a chance to shine. As the album title suggests, it contains a version of the Malinké classic "Koulandjan", for which Kasse Mady wanted to use the traditional version. He asked permission of the elders in Kela, which he received a few weeks later accompanied by a cassette explaining which parts of the epic song had to be included. The total length of the song including these lines would amount to 30 minutes. But Sylla stopped the recording after 13 minutes, much to the annoyance of Kasse Mady. Kasse Mady went back to live in Mali in 1998. In 2001 he was approached by Lucy Duran to record. Produced by Duran, the result is a mature album which set the tone for the albums which followed: strong songs selected from the Mande repertoire of Kela and Kangaba, mixed with a few excursions into other areas. Also, I would like to share with you this cassette, which was recorded (and produced) in Mali. It is undated, but my guess is that the cassette was recorded in the late 1990s. I had the chance to see Kassemady 2013 in concert - live in BKO, and I'm still happy about it. A tribute to our beloved Kassé Mady, with several videos singing live, all in Mali. A wonderful soul-stirring singer who will be missed. 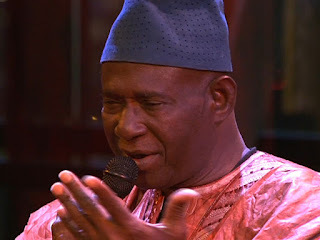 I was fortunate to see him at the UK's Musicport festival a few years back with Toumani Diabate's Symmetric Orchestra who were, for me, the standout band of the whole festival. Then in 2017, Trio da Kali played the same festival, again they were the standout band for me, and their astonishing amazing vocalist was Hawa, his daughter, as I later discovered. If you see or hear her you will know his legacy is still very much alive. A shame Kasse couldn't strike a deal with Sylla to do the full length version of that song in exchange for something else--perhaps singing I Love Paris with an Edith Piaf-soundalike. The French have much to account for in Africa. But I hope it would seem facetious to suggest that the trivialization of some great African talent by Parisian and Paris-inflected production houses isn't the least of their sins. love the mix of Kassé Mady, great music, once again thank you for sharing this ! Thank you for introducing me to Kasse Mady way back when.